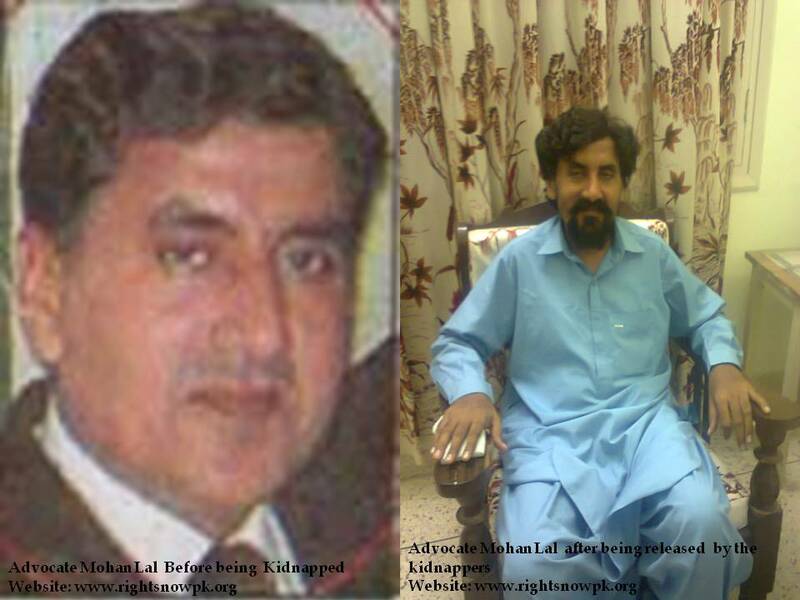 RightsNow Pakistan is relieved to announce the return of advocate Mohan Lal, a Hindu lawyer who was kidnapped last December 2011. Mohan Lal has been missing for last few months and finally returned home on 31st March, 2012. He was dropped outside the city of Mirpurkhas on the by-pass road at 11 am. His health was deteriorated and his beard was grown so long that his family could not recognize him when he first returned home. RightsNow Pakistan congratulates advocate Mohan Lal, his family, friends, relatives, the District Bar Association Mirpurkhas and our legal fraternity for the success of Mohan Lal’s release. RightsNow Pakistan representative advocate Kanji Mal Manghwar for Mirpurkhas met advocate Mohan Lal after his release. Mohan Lal lost a lot of weight and from his physical condition, it seems Mohan Lal was kept in very harsh conditions. It is also probable that during his detainment, he also suffered mental anguish. From reliable sources, we learned that Mr. Mohan Lal’s sister bought his freedom, paying a few millions. Even though the kidnappers have received money from advocate’s family, no action has been taken by the law enforcement authorities against them. This shows the weak level of security for Pakistani citizens and the unchecked strength of criminal gangs and mafias. The District Bar Association Mirpurkhas, led by advocate Salah ul din Panhwer, boycotted for a week, after advocate was kidnapped in December, for the release of kidnapped lawyers and sent letters to the Chief Justice, Supreme Court of Pakistan, the President and Prime Minister, but the protests bore no fruit. The kidnappers are simply too powerful. This and other similar situations sends the message to the common citizens that it is always better to pay kidnappers in order to get a person released than approach and work with law enforcement agencies. The people of Mirpurkhas feel insecure after learning about how Mohan Lal was released through ransom. Lack of action by security forces may encourage people to buy their security from these mafia and gangsters. It might also strengthen the reliance of citizens on gangs, further weakening the Pakistani’s faith in the law and legal actors. RightsNow Pakistan slams the kidnapping of lawyers and any citizens by criminals for ransom and calls for strong action against them. RightsNow Pakistan also calls upon law enforcement agencies to take stern and preventative security measures to increase the sense of security among common citizens. The role of the District Bar Association Mirpurkhas and other Bars is also important as they keep in check on the conduct of law enforcement authorities. In order to deal with the current circumstances, RightsNow Pakistan has designed a programme of protection trainings for lawyers so they can stay safe from would-be kidnappers and play better role in the society for the promotion and protection of human rights. RightsNow Pakistan requests the all citizens pray for advocate Mohan Lal’s physical and mental recovery.